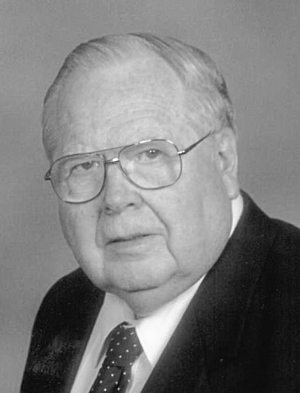 LEWISTON – Paul F. Johnson, 89, died peacefully at his home in Lewiston, on Tuesday, March 16, 2019. He was born in Milton, Mass. on Dec. 15, 1929, the son of the late Harry G. and Ebba (Peterson) Johnson and had been a resident of Barrington, R.I., Houghton, N.Y., Otisfield and Lewiston. Paul was a French professor, completing graduate work at Boston University, Brown University and Rhode Island College. He was also a Fulbright scholar and taught at Barrington and Houghton Colleges for 43 years. He enjoyed taking students to Paris and other parts of France. He was very involved at his church, serving as a deacon and Sunday school teacher, as well as singing in the choir. He loved to travel and especially liked to go camping. He loved music, including gospel choruses, organ music and opera. Paul was predeceased by his beloved wife, Elizabeth (Osmond) Johnson; his brother, Gilbert Johnson and sister, Claire Kannegieser. He is survived by his beloved wife, Margaret (Walker) Johnson; and his children, Karin (Dennis) Kohl, Linda (Richard) Barany, Kathy (John) Kelly, Douglas (Holly) Johnson, Steven (Anna Maria) Johnson, Dawn (Frederick) Ginn, Linda (Richard) Dennis, William (Bambi) Walker and Heather Mason; 21 grandchildren; and 28 great-grandchildren. Paul is also survived by his siblings, Elaine Donica, Dorothy Flett and David Johnson; and his best friend and colleague in teaching, Jean-Louis Roederer. Online condolences and sharing of memories may be expressed at www.lynchbrothers.com . Funeral services honoring Paul’s life will be celebrated on Wednesday, March 27 at 11 a.m. at the Court St. Baptist Church, 129 Court Street in Auburn, with a reception of fellowship to follow. The burial will be private at a later date, at the Forest City Cemetery in South Portland. There will not be any visitation hours at the funeral home. Arrangements by the Pinette Dillingham & Lynch Funeral Home 305 Alfred A. Plourde Parkway in Lewiston 784-4023.